7” / 18 cm circumference. 8” / 20.5 cm from wrist to fingertips, all sizes. 10” / 25.5 cm high, including cuff. To fit the average adult woman. 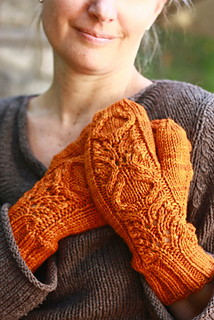 The lace pattern stretches significantly and will accommodate a range of hand circumferences. 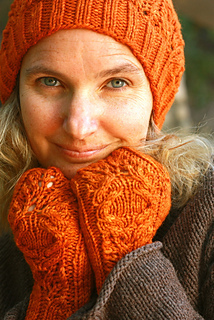 1 skein Shalimar Yarns Haven in “Land! 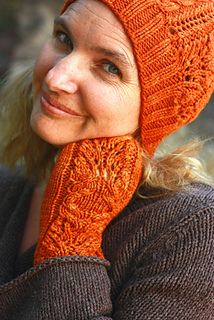 Katie Scarlet”; 247 yds / 226 m per 3.5 oz / 100 g; 63% merino wool / 37% tussah silk. 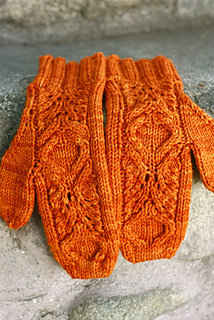 Mittens require approximately 150 yds / 137 m worsted weight yarn. US 6 (4.0 mm) DPNs. OR size necessary to make gauge. 20 sts, 29 rnds equal 4” / 10 cm in Stockinette stitch after blocking. 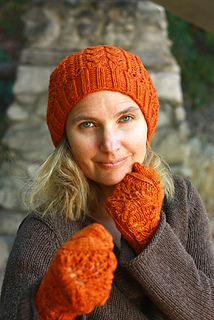 Mittens are worked in the round from the bottom up. Use the wearer’s hand measurements to achieve optimal fit. 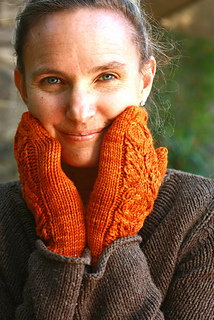 You may modify the pattern to accommodate different hand lengths by starting the Thumb Gusset at a different point in the pattern and working more or fewer rounds of ribbing at the cuff, if desired.